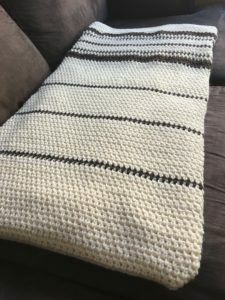 It is always surprising for someone as impatient as myself to have the patience to crochet or knit a blanket. For me, crocheting or knitting is almost meditative because it calms me and I really love how ‘brainless’ it is once you are familiar with the pattern. Blankets are NOT my favorite type of projects because of how long they usually take, but it is also the most satisfying when they are complete. 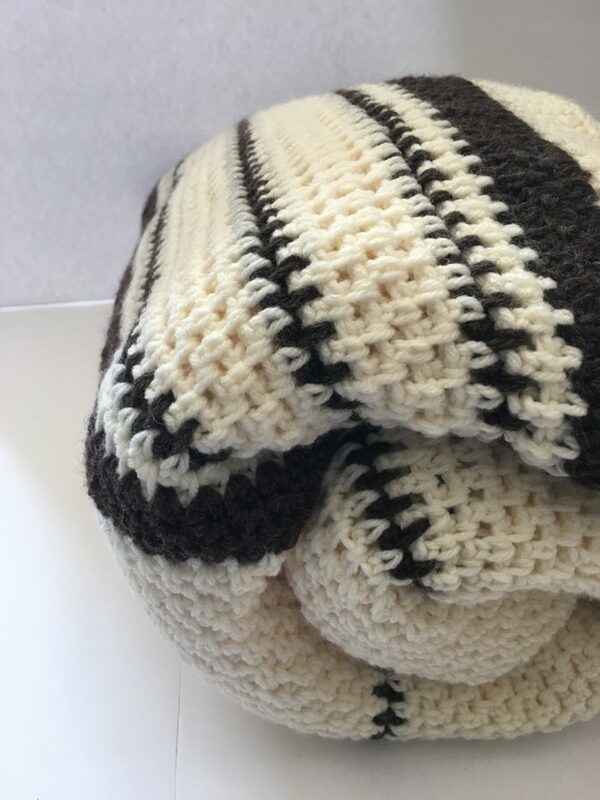 After browsing through pinterest for some modern blanket patterns, I came across the pattern below and I knew I had to make it. I altered the color to match my living room (the original one is white and grey which is also beautiful), but my sofa is brown so I chose brown and beige instead. 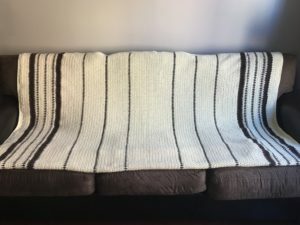 This blanket took me 2 months to complete, and a LOT of yarn. I didn’t splurge on my yarn (usually not on blankets) and it still costs around $60 on just material alone. That being said, the final product was a 200 cm X 150 cm blanket (so approximately 80″ x 60″), a good size for two to share on a sofa. My husband prefers this one than the other granny square blanket I made several years ago because of the ‘holes’ in the pattern; something about having his toes stuck in the blanket. 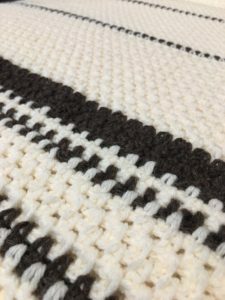 This blanket mainly utilizes the granite stitch which is super close knit therefore no holes, super warm, but takes SUPER long to make. I’ve also included the link to the original pattern below. And for anyone who wants this blanket but doesn’t have the patience to make one yourself, I do offer crocheting services. Please visit my Etsy Store for more information! 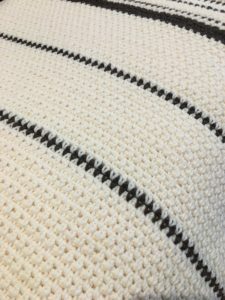 This blanket uses the granite stitch. You can find several helpful YouTube videos on how to make this stitch if you’ve never done it or refer to this LINK from Fiber Flux. You will be working single crochet stitches into the chain stitch below to create this look. When starting a new skein, begin using the skein at the start of the row for best results. Row 7 Sc in 2nd st from hook (in the first sc of row), *sk st, 2 sc in next stitch. Repeat from * across, sc in last stitch. Ch 1, turn. 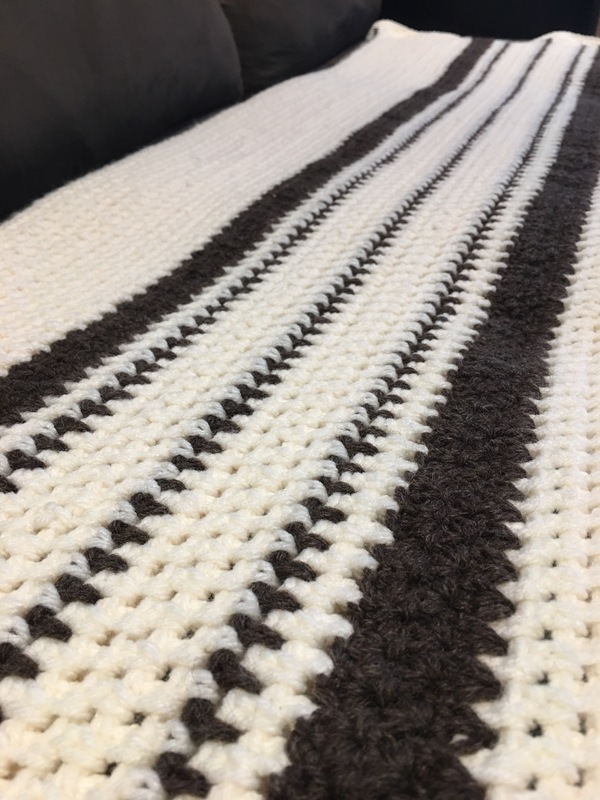 Evenly single crochet around entire blanket for three rounds. Now cuddle up with your blanket!